Combine participants go over their good and bad plays on tape with almost every NFL team they meet during the week-long affair, but very few have a film session centered around play after the whistle. Oklahoma guard Dru Samia is among the few, if not the only one. The 6-foot-5, 305-pound Samoan behemoth is often praised for his physicality and intensity. He’s a nasty finisher that plays to the echo of the whistle if not beyond it, and teams took notice. Samia said in a March interview with Pro Football Focus that one NFL team went over a playlist of his “extraness” and highlighted the nastiness they liked –and didn’t like — after the whistle. Teams liked most of the plays, of course. Samia’s aggressive approach to the game, however, does, as he admits, get him into trouble during and after the play. He earned an impressive 78.8 pass-blocking grade this past season but just a 62.7 run-blocking grade largely because of his tendency to prioritize physicality over technique. 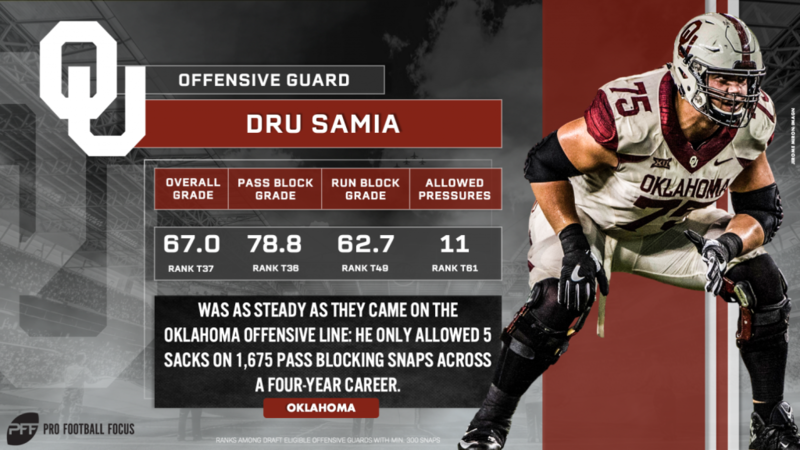 Samia earned a positive grade on 8.7% of his run blocks a year ago, a top-100 number and very impressive compared to the draft class. He, however, paired his impressive impact blocks with too many missed blocks, earning a negative grade on 9.1% of his run blocks. Removing the negative plays from his rap sheet starts with pad level, and he’s determined to improve in that area. “I have good horizontal leverage but as far as vertical leverage, that’s what kind of hinders me from moving these guys off the ball as much as I want to,” Samia said. “I can get movement along the line, but displacing someone vertically requires you to be under their pads. Constantly improving, in addition to his physicality, is what Samia holds in high regard. Samia is already a physical, impactful blocker with a mean streak – traits that can’t be coached or taught at the next level. The bully in him, combined with his above-average athleticism and size, create for a high ceiling at the next level, and if he continues to refine his craft and polish his technique, he’ll reach it in the NFL.